On August 24th, Moment Factory is launching a new interactive and immersive experience inside a New York City landmark. 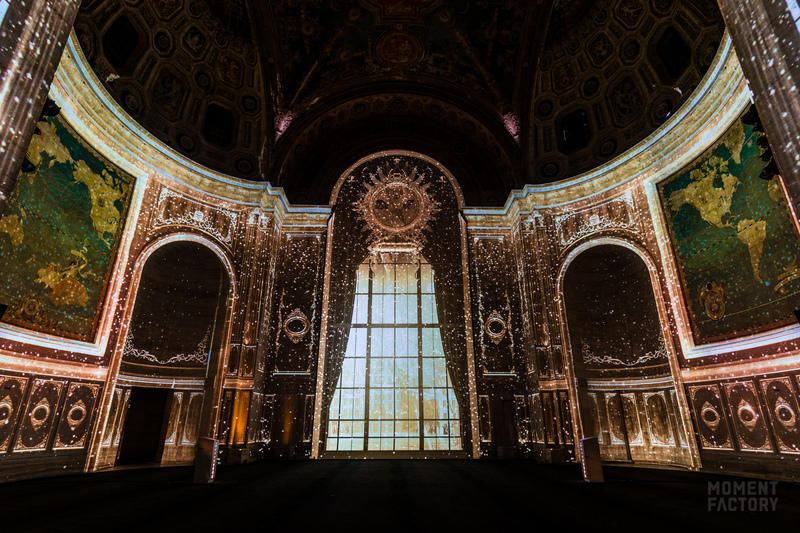 Inspired by the architecture and rich history of Lower Manhattan’s Cunard Building, we partnered with Cipriani to create Dream Ship DestiNY, a multimedia journey to New York. D.S. DestiNY invites audiences to step on board a classic ocean liner as it sets sail on an ocean of dreams. The voyage offers glimpses of New York, a mosaic of the many visions and hopes of the passengers aboard the ship as it travels from the old world to the limits of imagination. The show was designed to explore the Cunard Building as it is brought to life and transformed into a one-of-a-kind passenger ship by cutting-edge visual technology. The building is a neo-Renaissance architectural gem, built in the 1920s in the heart of the financial district, directly across from Wall Street’s famous Charging Bull. This immersive experience transforms this iconic landmark into a massive 360• digital canvas, enveloping its audience in light, color and sound. We’re excited to share this adventure with audiences and to help them discover an architectural triumph. D.S. DestiNY was created by Moment Factory and co-produced by Cipriani and Moment Factory. Discover more and buy tickets here.